How much funding can I access? Just as spring price peaks lasted a lot longer in 2016, the autumn price decline appears to be coming early in 2017. While finished cattle prices were relatively steady this week, waning restocker demand appears to be seeing young cattle prices continue easing. Cattle markets were mixed this week, very mixed. The Eastern Young Cattle Indicator (EYCI) continued its slide, losing 7¢ to hit an 8 month low of 613.75¢/kg cwt. Similarly east coast Heavy Steer and Eastern Cow prices also saw 8 month lows, with cow falling 10¢, but heavy steers only 3¢ to 533¢/kg cwt. Prices were mixed across the states, with most of the declines in Queensland, while in Victoria prices were steady or slightly higher. The Queensland Trade Steer fell to 308¢/kg lwt this week, and this is the category which is at the largest discount to other states. In Victoria Trade Steers made 348¢, while in NSW it was 331¢. 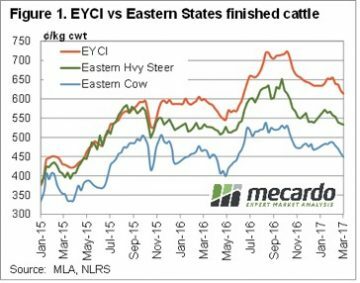 This suggests that young cattle supply is starting to move in Queensland, whereas it is normally still tight in southern states at this time of year. Young cattle still have some way to fall before they are back in line with ‘normal’ discounts to the EYCI. Figure 2 shows that despite the fall in the EYCI, Heavy steers remain at a 15% discount to the EYCI, while Cows are at a 25% discount. Heavy slaughter cattle discounts have narrowed marginally from two and five year lows, but are still a long way from their long term averages. 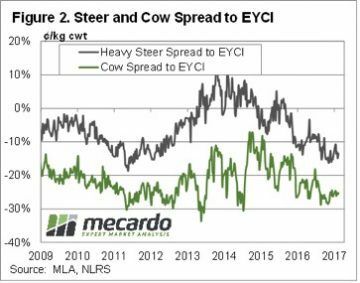 If Heavy Steer prices remain steady, the EYCI will have to fall back to 560¢/kg cwt, 50¢ below this weeks close. This tells us that there is still strong demand for young cattle, relative to where heavy slaughter cattle are. The latest margin analysis shows that slaughter cattle prices are also overpriced, which leaves plenty of downside if rain is not forthcoming, and supply picks up. Cattle price rally stalled and jammed into reverse. Copyright © 2019 StockCo Australia | 100% finance is subject to approval in accordance with StockCo’s eligibility criteria.